I did it. I took a classic Christmas cookie and made him a little creepy. The adorable gingerbread man cookie is now more suitable for Halloween. I think he’s still pretty cute, even if he’s dead. 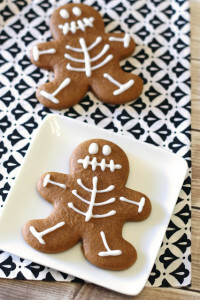 Gingerbread skeleton cookies. Another “spooktacular” sweet treat! 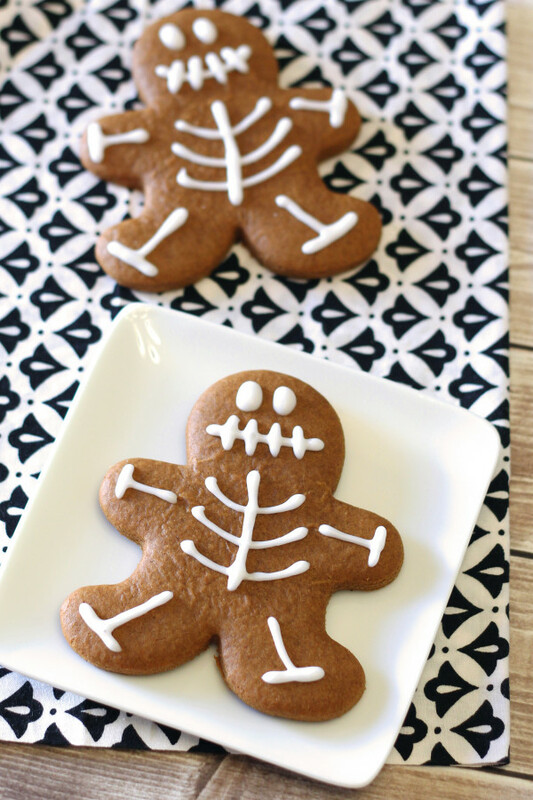 These frosted gingerbread men cookies are soft, not too sweet, and totally gingery. I like my gingerbread cookies on the thicker side so they stay nice and soft. You can make them as thick as you’d like. The simple icing is just powdered sugar and coconut milk, making it the easiest icing for cookie decorating. 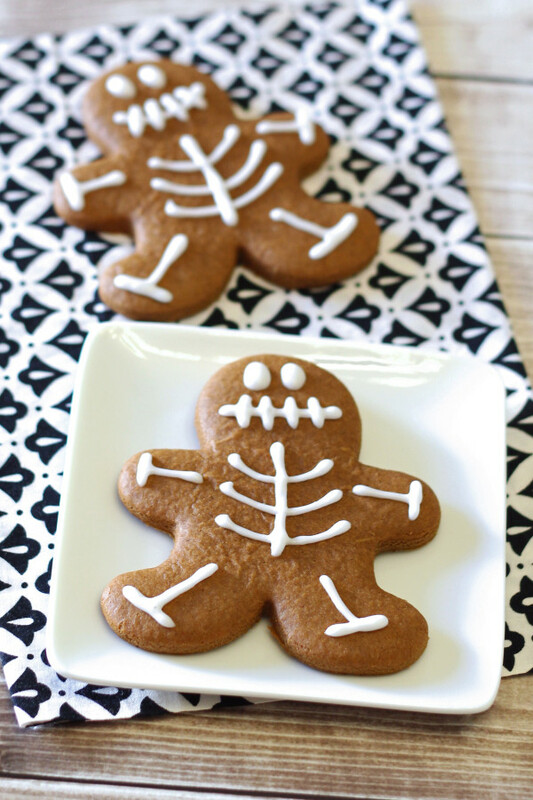 I made these for Kaden’s preschool buddies and they thought it was super cool to decorate their own skeleton cookie. A fun idea for a kids halloween party, for sure! In bowl of stand mixer, beat together powdered sugar, molasses, coconut oil, coconut milk and vanilla until smooth. Add flour mixture and continue to mix for 1-2 minutes. On counter, lay out large piece of plastic wrap. Place one disc of cookie dough in the center and top with another piece of plastic wrap. Roll with rolling pin until dough is about 1/4" thick. 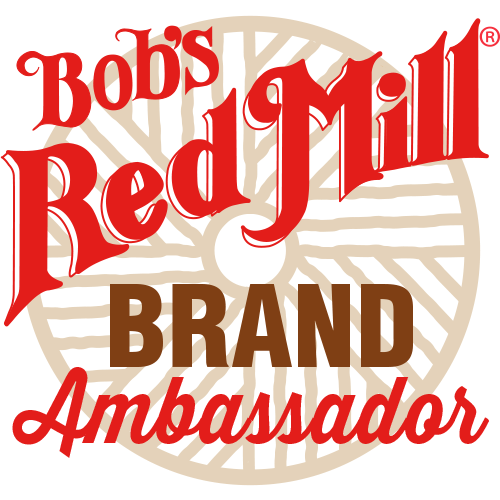 Cut dough using gingerbread man cookie cutter or desired shape. Carefully place cookies on prepared baking sheets (place dough back in refrigerator if it gets too soft to work with). Bake cookies for 7-8 minutes. Remove from oven and place on cooling rack to cool completely. While cookies are cooling, make simple icing. Mix together powdered sugar and 2 tablespoons coconut milk. Stir until smooth. Add more coconut milk as needed.